Point Bush Estates is a boutique family owned B&B (Te Kiteroa Lodge), vineyard, winery, Cellar Door and Restaurant (Vines) dedicated to excellence in winegrowing for high quality wine production. 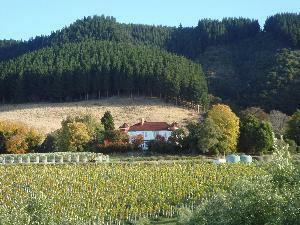 The vineyard is located on the east side of the Waimate hills with a north and easterly aspect. The Te Kiteroa area has excellent drainage off the ridge which creates a frost-free micro-climate. Plantings comprise Pinot Noir, Pinot Gris and Sauvignon Blanc. The fully equipped Winery processes the hand picked fruit using our "paddock to palate" quality statement.